To use Android Auto, you need an Android Auto compatible vehicle or aftermarket radio and an Android phone running 5.0 (Lollipop) or higher. 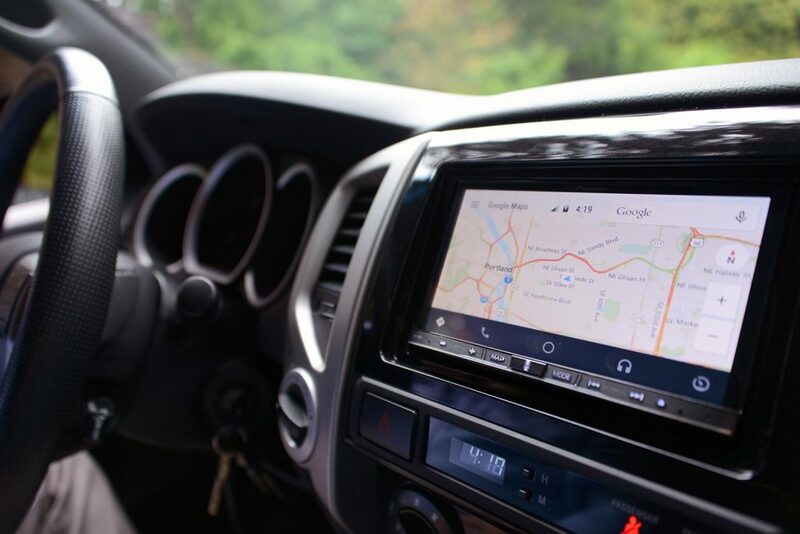 When you connect your Android phone to the compatible vehicle or radio, Android Auto will display applications on the vehicle’s screen. It’s easy to get where you’re going with Android Auto as it has the special features built into it such as free voice-guided navigation, live traffic information, lane guidance and more. All you need is a compatible aftermarket headunit or a vehicle that has Android Auto functionality. Simply plug in your phone and your phone will mirror the image onto the headunit. This way you can use the navigation maps on your phone. Android Auto is Google’s solution for bringing the power of your smartphone to the relatively dumb nature of vehicle infotainment. Basically you’re using your phone to broadcast a new user interface onto your car’s touchscreen, thus bringing the full power of the latest phones to your car. Phone calls are handled over Bluetooth. This opens up the possibility to use mobile apps such as Google Maps, Google Play Music, Google Now and a host of third-party apps. This means streaming your music to your vehicle becomes effortless as all the information will be displayed on the screen. You also have the option to make and receive phone calls using the contacts list within your phone. Android Auto apps have a consistent design, with large, round buttons for easy touch points, and similar menu structures. The idea is that apps won’t be any more distracting than they need to be (which is why user interface elements look the same from one app to another), and generally don’t need more than a quick glance to be put to work. A big update to Auto in late 2016 added a phone version of the Android Auto interface to the app, which displays the complete Auto interface solely on the phone. Essentially, it’s a new Car Mode, baked into Android itself. Android Auto also will support “OK Google” commands, meaning you can initiate searches and bark orders without having to hit a steering wheel button first, or touch the display. Android Auto-compatible cars are available in 30 countries from a wealth of manufacturers, and more are being added all the time. Older vehicles can find aftermarket solutions from the likes of Kenwood and Pioneer which start at £499.99.